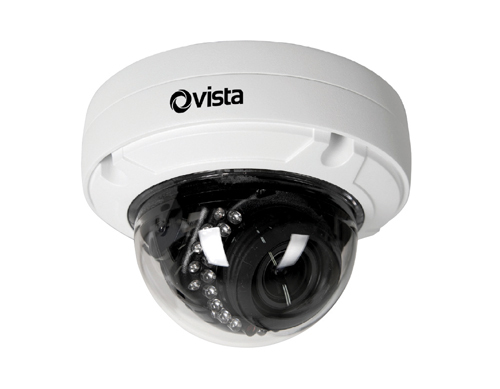 This dome is a 4MP vandal resistant model from the Vista VK2 range, with IP66 and IK10 protection ratings. A motorised 2.8 to 12 mm lens allows simple adjustment of the required field of view once installed. H.264 and H.265 formats are available with up to four streams. IR LED illumination is stated up to 25 metres. The camera is supplied fully assembled but has a protective film over the lens so it is necessary to remove the clear dome to remove this before testing. The clear dome cover is held in place by 4 captive security Torx screws. A flexible plastic “lanyard” secures the dome to the main housing but this can be unscrewed if necessary. Power can be PoE or supplied from an external 12v power supply. 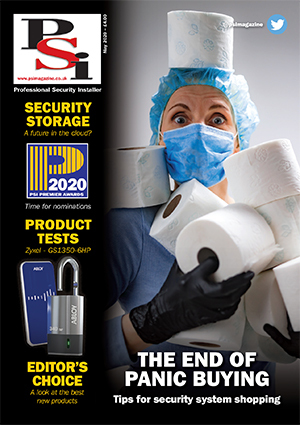 The supplied disk includes “Smart Manager” discovery software to help identify the camera on an Ethernet network. The unit is supplied with DHCP enabled by default so if connected to a suitably configured network a local subnet address will be allocated. Also included on the disk are Quick Install and User Manuals for a wide range of Vista cameras, the associated “Viper” recorders and Viper-Central display and monitoring software. Both the supplied user manual and a downloaded version state that a Micro SD card can be entered into the memory card holder on the PCB behind the sensor module. This is also shown as the location of a reset switch. This perhaps only relates to the 2MP version as this model has the card slot and reset switch positioned behind a hinged flap on the base of the dome. This does at least have the benefit of allowing the card to be changed without having to remove the dome cover and potentially disturbing the camera’s positioning. When powered the camera can be accessed via a web browser by simply selecting its IP address. This will give options for viewing the live feed, replaying recorded footage or setup. While browsers such as Firefox, Chrome and Safari can be used, IE is recommended as this appears to be the only browser to provide access to all features and highest image quality. IE does require an ActiveX component to be installed but this installed relatively quickly and reliably on both a Win 9 and Win 10 PC. A simple default administrator user name and password is set by default so should be changed prior to installation. If the password is lost, the reset switch procedure will restore all default conditions including its IP address.